Rand Paul's Israel problem: Foundation for a Secure and Prosperous America links him to Obama's Iran actions. 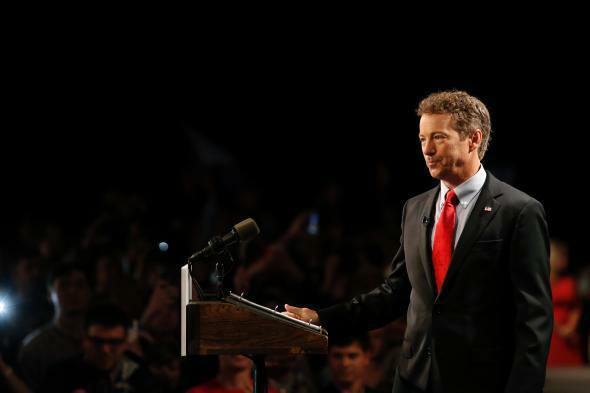 Sen. Rand Paul pauses while delivering remarks at an event announcing his candidacy for the Republican presidential nomination, at the Galt House Hotel on April 7, 2015, in Louisville, Kentucky. The ad is, not surprisingly, misleading. It claims Paul sides with the president on Iran, but he has voted for sanctions on Iran, was one of the signatories of Sen. Tom Cotton’s controversial letter to the Iranian government, and has been critical of the administration removing sanctions without Congress’s consent. But it is true, as David Weigel notes, Paul has evolved on how he discusses Iran, from dismissing the idea that it poses a security threat and supporting normalizing diplomatic relations with it, to his current, more orthodox Republican position. The Iran attack is probably just the beginning. Two years ago, in the days of Snowden and Benghazi, Paul’s isolationist (though he rejects the description), anti-militarist foreign policy might have been less of an electoral liability. His best-known action on foreign policy, a 13-hour filibuster against the use of drones to target U.S. citizens, polled well with voters. But with the focus on ISIS, Iran, and a seemingly ever increasing number of destabilizing Middle East conflicts, you can expect Paul’s rivals to cast his foreign policy views as dangerously naïve. Sen. Lindsey Graham gave a preview of how rivals will attack Paul earlier this week when Graham discussed the Iran deal on CBS’ Face the Nation. “The best deal, I think, comes with a new president. Hillary Clinton would do better. I think everybody on our side, except maybe Rand Paul, could do better,” he said. In building the case that Paul is to the left of the Democrats on foreign policy, the centerpiece of the argument will be Israel. The senator seems to be anticipating this. His campaign website has a page devoted to his proud support of Israel and touting his proposed “Stand with Israel Act”—which would cut off U.S. aid to the Palestinian Authority as long as it is cooperating with Hamas. The perception of Paul as anti-Israel is due mainly to his proposed federal budget from 2011, shortly after he entered the Senate, which would have entirely eliminated U.S. foreign aid. Sensing an opening, Democrats pounced on the fact that this would entail ending support for Israel. (No one seemed all that concerned about the other 30-odd countries that would lose assistance, but that’s another issue.) Paul not very convincingly tried to argue that Israel would be “strengthened” by this development and that it was in line with the views of Prime Minister Benjamin Netanyahu. He has since, even less convincingly, tried to argue that he never proposed cutting aid in the first place. Paul’s bill on Palestinian aid comes along with a concerted effort to reach out to skeptical Jewish Republicans, an effort that his dad hasn’t exactly made easy for him with activities like speaking at a well-known anti-Semitic group’s conference. In any case, pro-Israel Republicans don’t seem that convinced by Paul’s change of heart on support for Israel. It’s gotten to the point that Paul was mocked by right-wing media outlets for clapping with insufficient enthusiasm during Netanyahu’s speech to congress last month. Democrats would also certainly relish a chance to retake the pro-Israel mantle in this race should Paul win the nomination. Paul’s current strategy seems to be to argue that he never deviated from the party line on Israel and Iran in the first place. In general, once the campaign gets into full swing, his foreign policy and national security views will probably come out sounding a lot less distinctive from those of the other Republicans (and Democrats) in the race than they did back in 2011. This is a shame. An unfiltered Paul in the race might have served as a foil for the other candidates to prove their hawkishness (the role his father Ron played in the last two elections), but there would have been at least a chance of a debate on how America should approach its role in the world with multiple points of view represented.